Read through our Horse Birthday Party ideas and incorporate the best ideas into your party. We have awesome ideas for your party! To make this Horse birthday party invitations, you must download our horse picture and use the picture as background image to your invitations. Write the party information and print the invitations out. Finish it off buy putting some pink glitter around the corners of the invitations. To make this Horse birthday party invitations, you need to cut out horse shape invitations out of cardstock paper. Decorate the horse invitations with glitter pens. Write the party information on the back of the paper. Use pink envelopes with horse stickers. You are invited to Sandra's Magical Pony Birthday Party! Come! help us celebrate in a very special way! Because our birthday girl is turning eight! There will be pony ride and so much more! RSVP to "phone nr" by "date". If you are not going to have pony ride, just take that out of the wording! When the kids arrive to the Horse birthday party give them a horse headband, a tail, horseshoes and stick horses. Buy commercial ones or make your own. To make your own horseshoes you need two 3/4" dowels (10"long). Two 10" squares of 1" Styrofoam, and eight rubber ring from scanning jars. To make your own stick horse you need (for each one), 3/4" dowel (28" long), a sock, buttons, felt, and yarn. Stuff the sock with crumpled paper or scrap material. Add button eyes, felt ears and yarn mane. Attach the head to the dowel with a rubber band. Pick all or some of our Horse birthday party ideas for decorations. Decorated the house with lots of horse balloons and streamers all over the party area. Get a banner that says "Happy Birthday Anna" with horses on it. Take out all of your daughters plastic model horses and place them around the house. If she has lots of horse posters, put them up all over the house! Use a white tablecloth and plates, mugs, etc with horse images on them. Decorate the table with cut out horse photos (from a horse calendar). Tie a balloon bouquet to your daughters favourite plastic horse and place it as a table centrepiece. 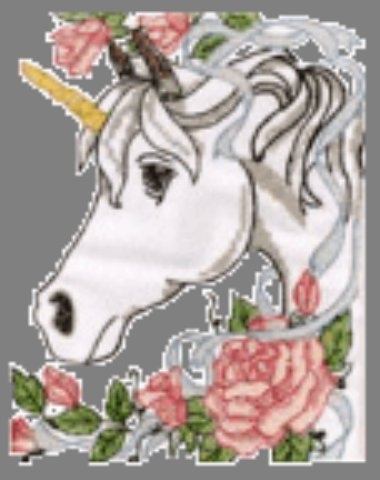 Invite the girls to decorate some horse clipart. Provide them with crayons and glitter. Before the party buy used horse shoes and spray them silver. Invite the girls to decorate their own horse shoe with colourful beads and plastic gems. Don't forget to provide them with glue. We have awesome Horse birthday party ideas for games and activities, just look below. This Horse birthday party game is similar to Pin the Tail on the Donkey. Before the party cut out lots of small tails out of brown paper (put double stick tape on the tails). Draw a tail-less horse on poster board and hang it to a wall. The first kid to go has to be blindfolded before she tries to pin the tail on the horse. This Horse birthday party game is similar to Duck Duck Goose. Invite the kids to sit in a large circle. One of the children has to be the Fox. The Fox walks around the outside of the circle, tapping the top of each horse's head. After a while the Fox chooses a Pony and calls out "PONY". The Pony has to stand up and quickly chase the Fox around the circle, trying to tag him before he reaches the spot were the Pony was sitting. If the Fox sits down were the Pony was sitting before getting tagged, he is save. Then the Pony becomes the Fox, but if the Fox is tagged before he reaches to sit down were the Pony was sitting before, the Fox must start the game again. Until another player becomes the Fox. If you have a big yard, why not rent some Ponies for two hours. The kids will love to ride on them. This Horse birthday party game is similar to musical chairs. Musical buckets - place buckets upside-down if your outside. If your are indoors play musical chairs. Scavenger hunts for horse -related items like a brush, comb, bucket, halter, rope, etc. Divide the children into two teams and let them compete in a relay race as they "ride their horses" with their stick horses. Parade around the house and outside the house with all the little horses. Finish the party off with a Horse Piñata. Fill the piñata with lots of candies and horse related items. We have lots of yummy Horse birthday party Ideas for food and drinks, have a look below. Pick the suggestions your daughter likes best. Horse Sandwiches: Make horse sandwiches with the help of a horse-shoe or a pony cookie cutter. Cupcakes: Frost the cupcakes in different colours- green, pink, silver, etc stick plastic horse decorations to the cupcakes. Horse Cookies: Make cookies in the shapes of horses with the help of a horse shape cookie cutter. To make this Horse birthday party cake you need to make two round cakes, let them cool well. Cut out two ears, a horse's nose (and the jaw) out of one of the round cakes. Then assemble those pieces around the other round cake. Look at our pony cake picture for help. Frost the cake pink. Use m&ms for the eyes and nose. Decorate the horse main as you whish. 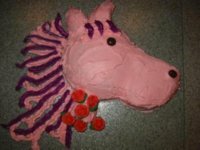 If you wan't something more fancy and would like to make a more professional looking horse cake, like a real horse picture on a cake. Ask the local bakery to print and sell you the tranfer paper. If you wan't a drawing of a horse, you can use a projector (get a small one for kids art projects). The drawing is projected onto the cake, then you can outline and fill it with icing. The actually goody bags for this party are bandanas. Fill the bandanas with favors and gather the four corners and tie a knot. Fill the party bags with a horse necklace, a pony tail holder, pony/horse tattoos, a note pad (with horses on them), and lots of small candies. Also, give the guest the horse headband, the tail, the horseshoes and the stick horses they were given when they arrived as favors. Before the group leaves take a group photo, scan the picture, make some decorations around the picture with your computer, print it out, put silver glitter around the borders and mail it out with a thank you note. I hope our Horse birthday party ideas will help you in your planning and I hope your princess will love and enjoy her Horse Birthday Party! If you have great Horse birthday party pictures, please SHARE them with us.